Bayer has opened its first emissions-neutral office building in Asia as part of its Group-wide sustainability program. 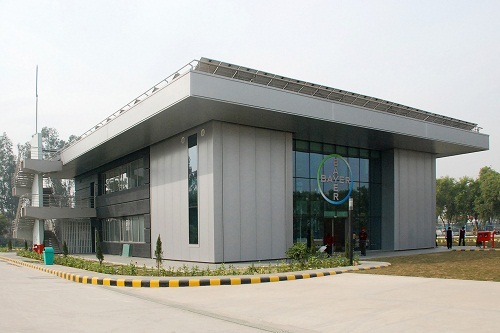 Bayer MaterialScience’s new building in Greater Noida, near New Delhi, India, which draws 100 percent of its electricity from a photovoltaic plant, needs some 50 percent less power than comparable buildings in the region. It is a further reference project for Bayer’s EcoCommercial Building (ECB) program, a specialist global network for sustainable construction. Bayer has previously built a climate-neutral company child daycare center at its Monheim site in Germany and an energy-optimized office building in Belgium. These projects show that approaches such as combining efficient insulation with renewable energies can help to dramatically reduce a building’s energy consumption and therefore its CO2 emissions. The EcoCommercial Building in India, which Bayer built in conjunction with local companies, shows that the concept is also applicable in sub-tropical climates. While in the temperate European climate zone building insulation is primarily used to protect against cold, its foremost purpose in countries such as India is to protect against heat. Foams based on high-quality materials from Bayer MaterialScience perform both tasks with exceptional efficiency. The new office cost around EUR 5 million to build. It is part of an investment package that Bayer has been implementing at the Greater Noida site. This also includes a new color competence and design center for polycarbonates and Bayer MaterialScience’s existing systems house. In total Bayer has invested around EUR 26 million in these projects. The new office building is located in the industrial region of Greater Noida, some 40 kilometers to the south-east of the Indian capital New Delhi. It is approximately 1,000 square meters in size and can accommodate around 40 workstations. It also serves as a model for customers of a sustainable, climate-friendly building solution. Taken over the year as a whole, the building is CO2-neutral. In other words, energy consumption for heating, cooling, ventilation and lighting is covered in full by renewable energy. A photovoltaic system on the roof generates some 120,000 kilowatt hours of renewable electricity each year. That is equivalent to a reduction of approximately 108,000 kilograms of CO2 emissions. The two-story, cube-shaped building was designed using extensive computer simulations and was adapted effectively to suit the local sub-tropical climate. The building is aligned according to the path of the Sun. The walls, roof and floors are insulated with polyisocyanurate (PIR) rigid foam to keep the heat out. Over its service life, this material helps save some 70 times as much energy as is needed to produce it. Highly efficient air-conditioning and lighting systems are also used in the building. What’s more, the ratio of windows to walls has been calculated with great precision, with transparent surfaces making up a good third of the total area.